For the third straight year, the Warriors will head to Cleveland with a 2-0 lead in the NBA Finals after a 122-103 win in Game 2 on Sunday in Oakland. Golden State got strong performances up and down its roster, including a record-breaking shooting display from Stephen Curry. Let’s take a closer look at Golden State’s Game 2 win with a deep dive into the box score. Stephen Curry set an NBA Finals record with nine 3-pointers in Game 2, breaking the previous record of eight held by Ray Allen (Celtics vs Lakers, 2010). Curry shot 9-17 from beyond the arc, including a perfect 5-5 in the fourth quarter as the Warriors pulled away. Curry shot 1-8 from beyond the arc in the first (1-5) and third (0-3) quarters combined, but was 8-9 from three in the second (3-4) and fourth (5-5). Check out Curry’s shot chart, video and full shot details from his historic shooting performance. With his nine 3-pointers, Stephen Curry passed LeBron James for the most 3-pointers ever made in the Finals. LeBron ranks second with 85 after he made two 3-pointers in Game 2, but Curry has surpassed him with a career Finals total of 90 triples. LeBron James scored a combined 80 points in the first two games of this year's Finals, which is the fourth-most points through two games in Finals history. Top three: Jerry West (94, 1969), Shaquille O'Neal (83, 2000), LeBron James (83, 2015) according to the Elias Sports Bureau. With 29 points in Game 2, LeBron James (1,327) passed Kareem Abdul-Jabbar (1,317) for second place on the all-time Finals scoring list. LeBron trails only Jerry West (1,679), who averaged 30.5 points in his 55 career games in the Finals. Stephen Curry, Kevin Durant, and Draymond Green became the second trio in NBA playoff history to total 7+ REB and 7+ AST in the same game, according to Elias. On April 7, 1960, Clyde Lovellette, Johnny McCarthy, and Si Green achieved that feat for the St. Louis Hawks versus the Celtics. For the third straight year, the Warriors have earned a 2-0 lead over the Cavaliers in the NBA Finals. Teams that lead the NBA Finals 2-0 have a 29-4 record. However, the last team to overcome that 0-2 deficit was Cleveland in 2016 as they won four of the final five games to win the championship. Of the bench players that played at least five minutes in Game 2, the Cavaliers got 11 points on 3-15 shooting from the quartet of Jeff Green, Kyle Korver, Larry Nance Jr and Jordan Clarkson. For the Warriors, they got 18 points on 8-14 shooting from Jordan Bell, Shaun Livingston, Kevon Looney, Nick Young and David West. Shaun Livingston has yet to miss a shot in the 2018 NBA Finals. After scoring 10 points on 4-4 shooting in Game 1, he followed it up with another 10 points on 5-5 shooting off the bench in Game 2. JaVale McGee earned his first start of the Finals and made an immediate impact, scoring the first four points of the game on a pair of dunks. He finished with 12 points on a perfect 6-6 shooting (five dunks, one hook shot) in just under 18 minutes. Kevin Durant led all players in plus/minus as the Warriors outscored the Cavaliers by 24 points in Durant’s 38 minutes on the court. After a subpar outing in Game 1, Durant had an efficient performance in Game 2: 26 points on 10-14 FG, 2-3 3P, 4-4 FT to go with nine rebounds, seven assists and two blocks. Klay Thompson showed no signs of being hampered by his injured ankle as he finished with 20 points on 8-13 shooting, including 3-8 from beyond the arc. He did play the fewest minutes (33:42) of the Warriors’ big four. Stephen Curry made as many 3-pointers as the Cavaliers did as an entire team in Game 2. Cleveland shot just 9-27 (33.3%) from beyond the arc. This postseason, the Cavs are 8-0 when they shoot 35% or better from 3-point range; they are just 4-8 when held below 35% as they were in Game 2. Kevin Love had his fifth 20-10 game of this postseason; the Cavs are 2-3 when he goes for at least 20 points and 10 rebounds, with Sunday’s Game 2 being their third straight loss. The Cavs offense scored 122.4 points per 100 possessions in the 23 minutes that Tristan Thompson was on the court - the highest rating of any Cavs player that played more than five minutes. Thompson’s offensive rating is 15.6 points per 100 possessions better than the team’s overall offensive rating for Game 2 (106.8). The Warriors scored 134 points per 100 possessions in Kevin Durant’s 38 minutes - the highest mark of any starting player. David West led all players with a 140.8 offensive rating in 11 minutes off the Warriors bench. The Cavaliers assisted on 25 of their 37 made baskets in Game 2, for an assist percentage of 67.6%; it was their second-highest assist percentage of the playoffs (April 15 vs Indiana), with both efforts coming in a loss. LeBron James assisted on 59.1% of Cleveland’s baskets while he was on the court in Game 2. In addition to his 29 points scored, LeBron created 31 more with his 13 assists, accounting 60 of Cleveland’s 103 points (58.3%) in Game 2. After Game 1 was played at a slow pace (92.59) - the second-slowest game for the Warriors this postseason - Game 2 saw the pace increase to 96.34. Kevin Durant shot 8-22 and posted an effective field goal percentage of 38.6% in Game 1 - his second-worst shooting game of the playoffs. He bounced back in a big way in Game 2 as he shot 10-14 from the field and 2-3 from beyond the arc for an effective field goal percentage of 78.6% - more than doubling his output from Game 1. For the second straight game, the Cavaliers dominated the Warriors in second chance points (19-9), with Kevin Love and LeBron James scoring five apiece to outpace Golden State by themselves. Both teams limited their turnovers - 11 for Cleveland and 12 for Golden State - but the Cavs took advantage of the Warriors mistakes by converting those turnovers in 13 points. The Warriors scored just seven points off of Cleveland’s miscues. LeBron James led all players with 16 points in the paint, followed by JaVale McGee with 12 paint points in his first Finals start. Both LeBron (8-9) and McGee (5-5) were outstanding in the restricted area, but James missed all five of his attempts inside the paint but outside the restricted area, while McGee made his only attempt. For the game, LeBron James shot 8-9 in the restricted area, but was just 2-11 from everywhere else on the court, with his only two baskets coming from beyond the arc. The Cavaliers scored just 3.9% of their points on mid-range shots (including one by Jose Calderon in the closing minutes while the benches were emptied). That is the second-lowest percentage for the Cavs this postseason (1.7% vs Boston on May 19). Cleveland shot just 2-12 on mid-range shots in Game 2, compared to 7-11 from Golden State. The Cavaliers scored 50.5% of their points inside the paint in Game 2, compared to 41.0% from the Warriors. However, Golden State was much more efficient on their paint opportunities than Cleveland. In the restricted area, the Warriors shot 20-25 (80%) compared to 21-31 (67.7%) for the Cavs. For shots inside the paint but outside the restricted area, both teams made five shots, but the Cavs attempted 20 (25.0 FG%) compared to the Warriors 10 (50 FG%). As part of his record-breaking performance, Stephen Curry scored a game-high 81.8% of his points (27 of 33) from beyond the arc in Game 2. It was his highest mark of any game this season - playoffs or regular season. Among players that played at least five minutes, Stephen Curry led the way in usage rate at 39.1%, well ahead of LeBron James’ team-leading 28.8%. For Curry, it was his highest usage rate of the postseason and his second-highest in any game this season (41.4% at Brooklyn in November). 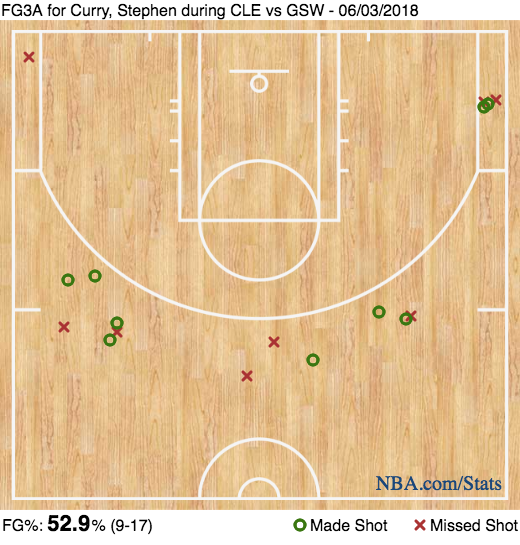 Stephen Curry scored nearly a third (32.7%) of all of Golden State’s points while he was on the court, which led all players that played at least five minutes. He was followed by LeBron James (31.2%), Shaun Livingston (27.8%) and Kevin Love (27.5%). The Warriors won Game 2 by 19 points and outshot Cleveland by 20.4% in effective field goal percentage, 66.5% to 46.1%. Golden State’s 66.5 eFG% as a team is their highest mark of the playoffs by over four percent. They only had six games better during the entire regular season. Cleveland held the edge in free throw rate (0.289 to 0.256) as they made (20) and attempted (26) more free throws than the Warriors in Game 2. Cleveland shot 76.9% from the line, while the Warriors were just 61.9% (13-21) on free throws. For the second straight game, the Cavaliers dominated the offensive glass, although the Warriors kept it slightly closer than they did in Game 1. Cleveland grabbed 32.0% of all available offensive rebounds - 16 total - and converted those extra opportunities in 19 second chance points. In addition to stuffing the traditional box score like he always does, LeBron James also led all players in two key hustle categories: deflections (6) and loose balls recovered (5). Tristan Thompson finished with just five rebounds, but he did lead all players with 12 box outs in Game 2. While Kevin Love (10), LeBron James (9) and Larry Nance Jr (6) all had more rebounds than Thompson, they were helped by Thompson boxing out opponents all night.